It's very pervasive to see this kind of question on Android forums. Yes, the request of rooting seems to be the biggest Android issue. However, is it really that difficult or complicated for rooting? Not yet. This time you can have chance to get the overall understanding of rooting and get to know how to root your phone. What Is Rooting Your Device? How to Root Android Phones & Tablets? In most cases, you will go to Google and search"how to root android". Then, a lot of best root Android apps will appear. Seriously, how to choose? 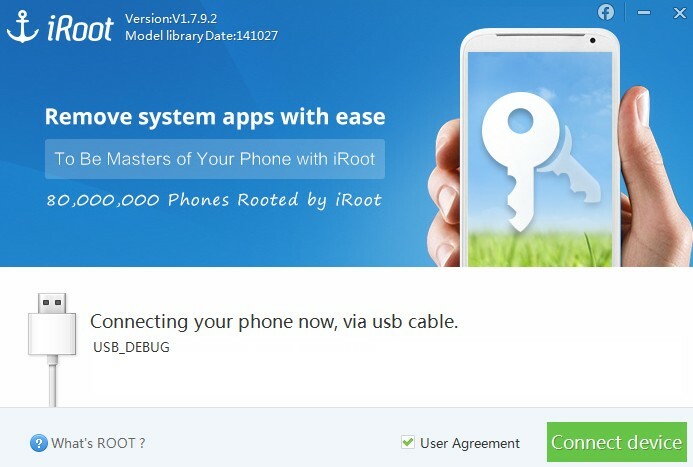 Here I will introduce the easiest and fastest iRoot to get one click root for your Android devices. Move to the full tutorial on how to root your Android device with iRoot. Here we take iRoot for PC for example. If you need to root without computer, please choose iRoot APK. Step 1. Download and install iRoot on your computer. Step 2. Connect your device via USB cable to your computer. Here click "Connect device". And then, install driver. Note: Choose “User Agreement” means you accept our service. Step 3: After detecting your device, iRoot will ask you to root. Click “Root” to allow this step. Step 4: Then your phone or tablet will reboot after getting rooted. Thus, you have learned how to root Android phone/tablets successfully. After that, you can enjoy all of the amazing features blocked by Android manufacturers and developers. Go and get some apps for rooted devices at the very beginning now.